Recipe4mac 1.2.1 is food & drink software developed by Recipe 4 All. 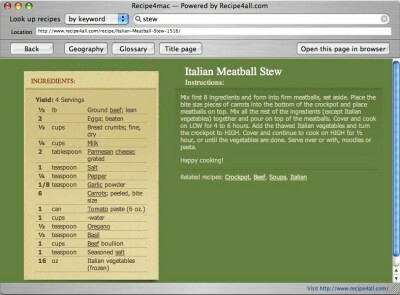 Recipe4mac lets you navigate through thousands recipes from the Recipe4all.com database with a neat Mac interface. 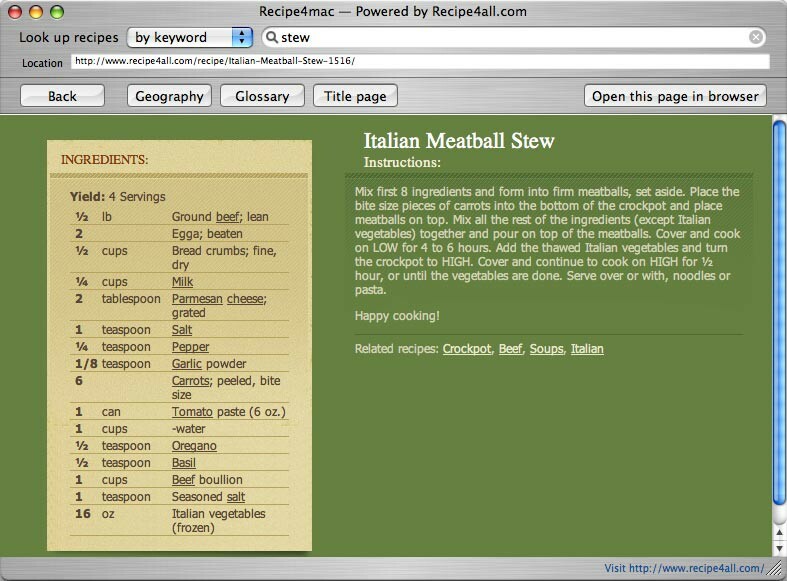 Visually resembling the Safari browser Recipe4mac allows you to search recipes by keywords, by ingredients or by geography. It also has direct access to the glossary. With a single click you can see the same recipe or listing in your default web browser. This home & hobby program is freeware, so you can download and use it absolutely free. Recipe4mac 1.2.1 supports different languages (including English). It works with Mac. We have tested Recipe4mac 1.2.1 for spyware and adware modules. The software is absolutely safe to install. Our website has thoroughly tested home & hobby product Recipe4mac 1.2.1, written the review and uploaded installation file (58K) to our fast server. Downloading Recipe4mac 1.2.1 will take several seconds if you use fast ADSL connection.